The Year 9 Challenge program at Northside Christian College runs throughout the school year and challenges students to move out of their comfort zones and overcome hurdles, while learning to work collaboratively with their peers and teachers. The program provides opportunities for students to develop their independence as they grow through experience and begin to demonstrate the good judgement that comes with maturity. During the last week of May, the Year 9 students participated in the City Challenge, trading their school desks for the city pavements. There was a buzz in the air on the first morning as the students made their own way into the city with their travel buddies to meet their teachers at the Federation Square home-base. Learning to navigate the public transport system and managing their time to make the allotted appointments throughout the CBD was a new experience for some students and definitely a challenge for some. The students engaged in new experiences and learnt to solve problems while looking out for one another. They visited historical and cultural sites and encountered some of the community issues found in and around the city. In the pursuit of being active and more informed citizens, the students and staff were moved by the stories of youth homelessness in Victoria while at the Melbourne City Mission’s Front Yard services. 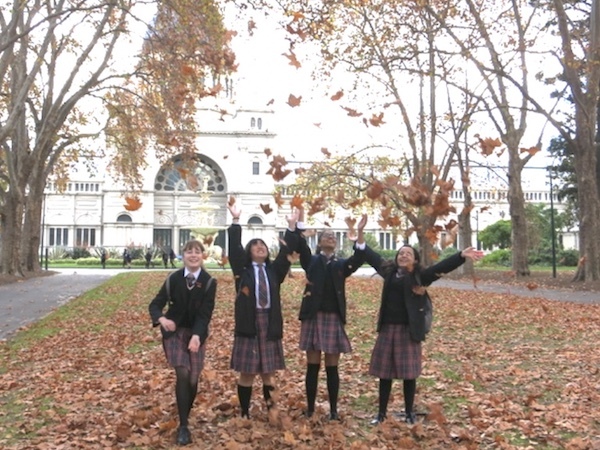 Students took time out to investigate Melbourne Museum’s Indigenous display and later had the opportunity to pray and reflect at St Paul’s Cathedral. During one of the daily sessions, the students were asked to make comparisons of the cityscape and architectural developments over the past 180 years, as well as having the unique opportunity to observe an actual archaeological dig being undertaken as part of the Metro Tunnel project. In preparation for the City Challenge, the class had been challenged to consider why is Melbourne one of the world’s most liveable cities. Together in small groups, they collaborated to form an inquiry that saw the students investigate and gather data throughout the four days they were in the city, in preparation for the upcoming Learning Showcase. Some of the highlights of this year’s City Challenge Experience included students familiarising themselves with Melbourne’s café culture, meeting Australian television personality Dr Chris Brown, having the freedom and independence to make decisions and find their way into the city and exploring the various cuisine on offer.